Team Chernyshev won the KHL All-Star Skill Show on the first day of action in Kazan. Bob Hartley’s team won three of the five events to take the honors ahead of tomorrow’s four-team All-Star tournament. Two of Hartley’s Avangard players were instrumental in securing the win. Goalie Igor Bobkov came out on top in the Defense vs Offense event, stopping six attempts in a row. Forward Sergei Shirokov demonstrated the sharpest shooting. Shirokov then secured victory for his team on the decisive leg of the Hockey Biathlon, thanks to some sharp tactics. Reckoning his skating speed to be better than his accuracy, Shirokov fired off his five pucks as quickly as possible, heedless of the target, and blasted through five penalty laps quickly enough to breast the tape ahead of the competition. The other prize winners were Dmitry Kagarlitsky (fastest lap) and Alexander Yelesin (hardest shot). Each prize was sponsored by one of the league’s commercial partners – Megafon, Sogaz, Hankook, Haier and Mastercard. One of the new traditions of the All-Star Week is the promotion of women in hockey. 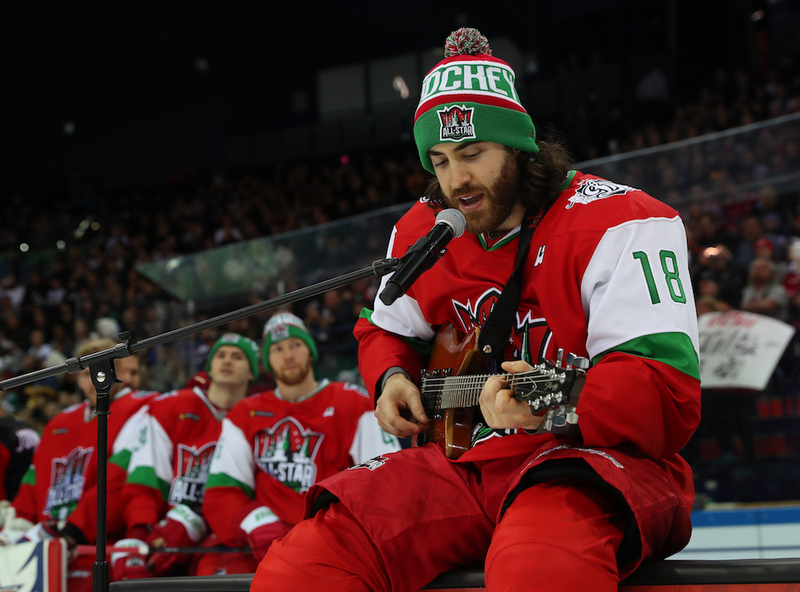 From the Women’s Hockey League All-Star Game in Nizhnekamsk last Sunday to the coaching staff at the KHL festival, it’s not hard to find a woman’s touch on proceedings. Four female hockey journalists, Natalya Klark, Darya Mironova, Maria Bass and Evgeniya Golovina, joined the coaching staff for the weekend; four officials from the WHL – Darya Yermak, Olga Steinberg, Diana Mokhova and Yekaterina Smirnova – took charge of events on the ice; two stars of the WHL, Nicol Chupkova and Maria Pechnikova, were on hand to demonstrate each of the events. 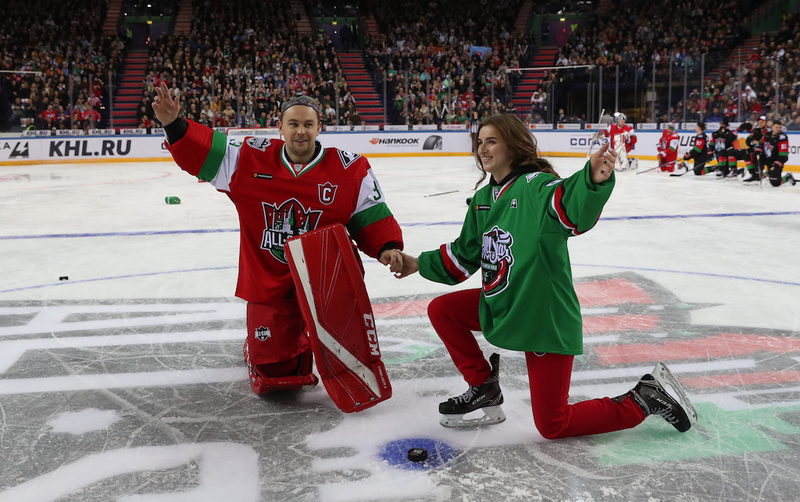 Chupkova also found herself taking part in the latest installment of the Guda-show, the trademark performance of Spartak goalie Julius Hudacek. This time he led Team Bobrov on to the ice with a dance routine, and invited Chupkova to be his partner. 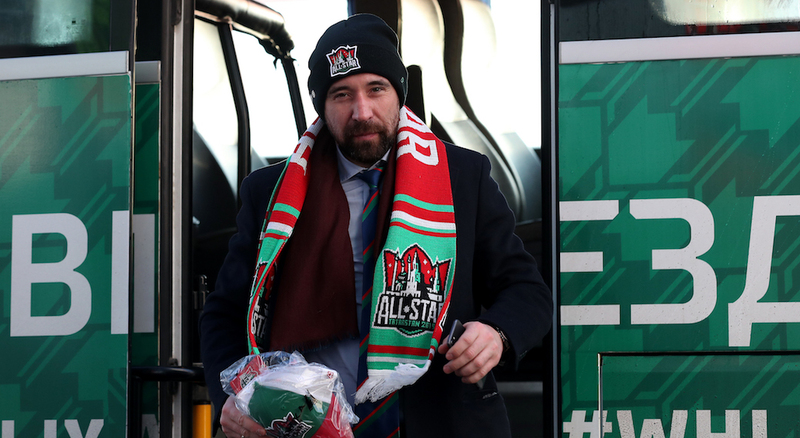 Later, he insisted that it was Natalya Klark’s idea, admitting that the star of Match-TV had pulled rank on SKA head coach Ilya Vorobyov to take charge of affairs on Saturday. There was no shoot-out competition this year, but that didn’t mean an end to the inventiveness and humor of our players. In the Defense vs Offense event, Team Chernyshev sprang a surprise by inviting former Russian international Dmitry Sychyov to take a penalty shot. You don’t remember Sychyov suiting up for Team Russia? That may be because he was a footballer who played at the 2002 World Cup and 2008 European Championship. However, he’s also a big Avangard fan and was happy to join in – as long as he could use a soccer ball instead of a puck. 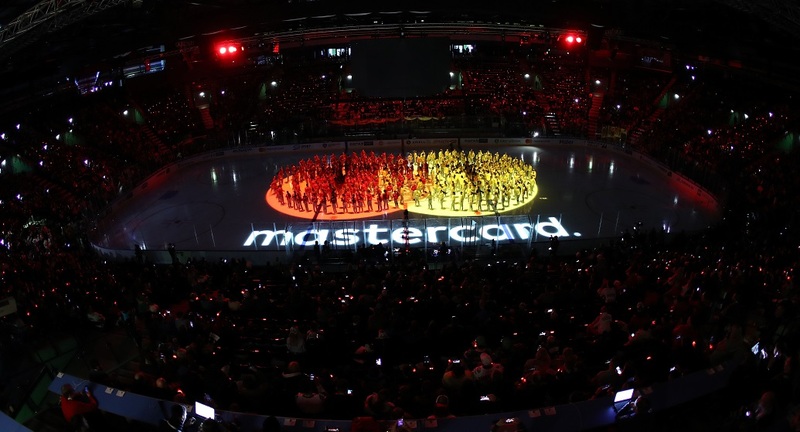 Unluckily for him, it turned out that Jakub Kovar was also a soccer fan – and pulled off a football-style save to keep the puck out. Then came the fancy dress. HC Sochi goalie Konstantin Barulin produced a new uniform for his game – the smart black top hat and tails of a London dandy. 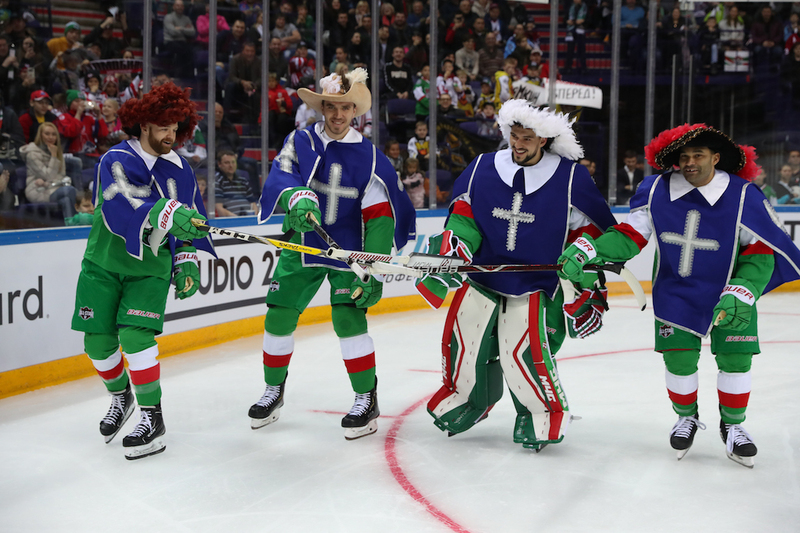 Avtomobilist’s four-man contingent on Team Kharlamov drew inspiration from the three musketeers: Jakub Kovar, Nigel Dawes, Nikita Tryamkin and Stephane Da Costa took on a cavalier look – but who was playing the role of D’Artagnan? The show, of course, was centred on Ak Bars’ arena. But the events went on all over the city. The day began at Kazan’s Family Center, a noted city landmark on the banks of the river, shaped like a traditional Tatar cooking pot (because a warm kitchen is at the heart of any happy family). 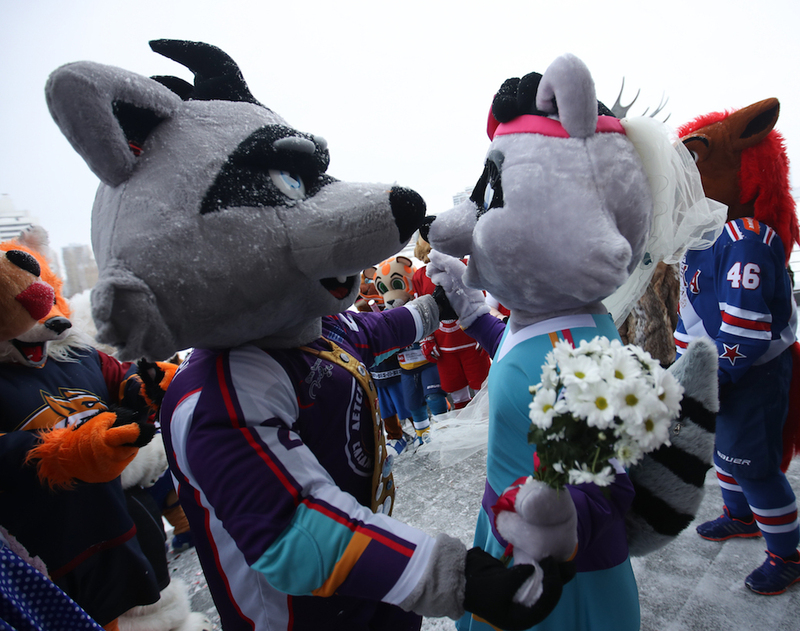 Here, we saw a wedding between two mascots from the children’s sledge hockey league in Kazan. SKA’s Fiery Stallion and Torpedo’s reindeer mascot served as witnesses to the happy occasion. That Stallion was showing off his horsepower again in an open-air game between teams of KHL mascots before the arena doors opened.